SANTA CRUZ, CA--(Marketwire - July 10, 2008) - Fullpower® announced its MotionX™-Poker game for iPhone and iPod Touch to be available exclusively from the new Apple App Store today. Fullpower uses the iPhone's accelerometer and innovative multi-touch display to put seemingly real dice in the player's hands. "MotionX-Poker revolutionizes mobile gaming and takes advantage of everything that's great about the iPhone and iPod Touch," said Arthur Kinsolving, director of technology for Fullpower. "It's original gameplay and is designed and optimized exclusively for the iPhone OS platform." The player shakes the device to roll the dice. The dice use real-world physics to roll, collide and settle just as if they were actual dice. Gameplay is simple and similar to a standard poker game, with each side of the die representing a different card. Each player has up to three rolls to get a winning combination of Poker dice. The player with the best hand at the end of these rolls is the winner. 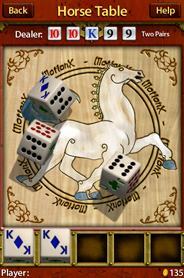 Users can also play any dice game through the game's 'Zen Roll' mode. Fullpower has developed the MotionX Recognition Engine and the MotionX Embedded Physics Engine. The MotionX Recognition Engine captures the player's hand movement. The MotionX Embedded Physics Engine then runs this motion information through advanced mathematical algorithms and determines the outcome of the roll. The user's actual shake determines the outcome of the roll as in real life. Tilt' N Roll™, ShakeShake™ and Taptap™ gestures individually and in combination are all integrated with the game-play. The MotionX-Poker iPhone game will be available for download worldwide for an introductory offer of $4.99 from the Apple App Store at www.itunes.com/appstore/. Founded in 2003 by Sonia Lee and Philippe Kahn, Fullpowers mission is to put sensing and motion-sensing in particular in every mobile device. MotionX is the motion recognition platform developed by Fullpower. As the leader in mobile sensing solutions, Fullpower is building on its expertise in wireless sensor technology to deliver unique, interactive motion-sensing games and applications. MotionX solutions are designed and developed in Santa Cruz, California. For a list of frequently asked questions regarding Fullpower and MotionX, visit Fullpower and MotionX Q&A. For an overview of the art of sensing and Accelerometrics, visit Fullpower Accelerometrics: The Art of Motion Sensing.